Who are you? What makes you - you? Are you only your face? Your clothing and possession? Absolutely not. So who in the world are you? Free to be Me will help you find the answer to that life-changing question. And, amazingly, it will help you find the answer through the mitzvah of tznius, modesty - which is so much more than a dress code. Free to be Me is a very unusual book, because we live in very unusual times. It's practical, with exercises and summaries to help bring its ideas into our lives. It's relatable - it was reviewed by dozens of women, of all ages, to make sure it speaks to our modern challenges and concerns. And, with its light tone and great cartoons, it's just plain fun! 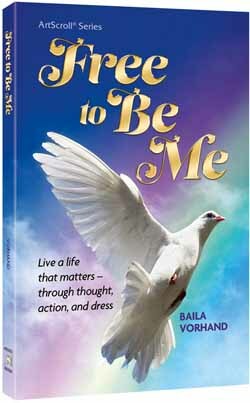 Free to be Me takes you on a journey of self-discovery. Get ready for challenges, surprises, and a whole new way of looking at yourself!